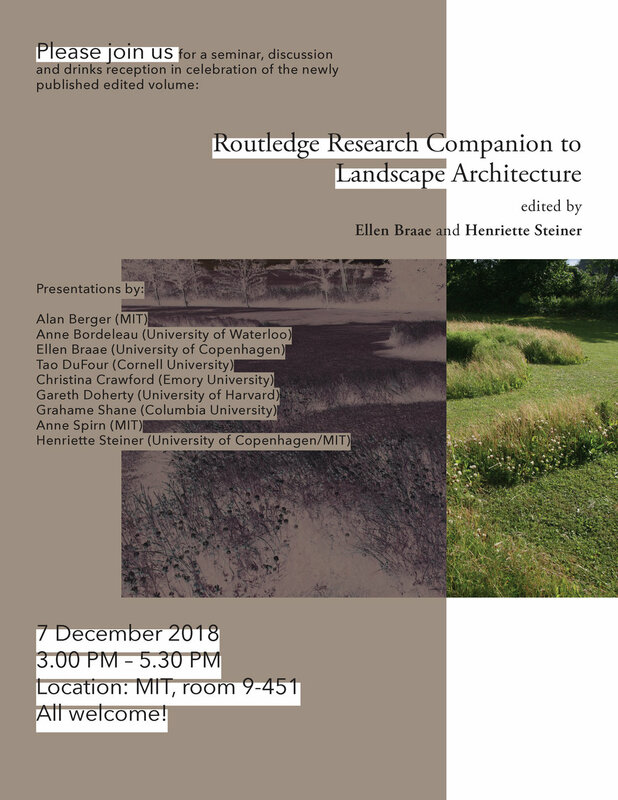 Book launch / seminar for Routledge Research Companion to Landscape Architecture @ MIT Friday, December 7. Come enjoy a seminar, discussion and drinks reception in celebration of the newly published volume, Routledge Research Companion to Landscape Architecture. I’ll give a short presentation of my chapter, “The Case to Save Socialist Space: Soviet Residential Landscapes Under Threat of Extinction,” which considers typical mass housing complexes constructed by the Soviet state in the 1920s and 1930s, and post-1950—communities designed to meet residents’ housing, educational, cultural, commercial, and recreational needs in all-inclusive precincts. The remarkable eighty-per-cent-open site plans that these complexes proffered signalled the presence of a fully socialist land regime in which land held no monetary value. Now, more than twenty-five years after the fall of the Soviet Union, this exterior collective space that was a hallmark of Soviet socialist housing provision is under threat of extinction. In the spring of 2017, the Russian State government took up a bill to demolish nearly 8,000 ‘decrepit’ Moscow residential buildings in order to parcelize and sell the capacious landscape in which they sit on the open real estate market. The chapter makes an argument for the unique qualities of these disappearing residential landscapes by articulating what so-called socialist space is, how it operates, what makes it worth preserving, and in conclusion offers options for approaching these fleeting remnants of a past economic regime. Join us for the celebration at MIT!